DEEPWAVE (Deep Propagating Gravity Wave Experiment over New Zealand) studied the dynamics of gravity waves (GWs) from the surface of the Earth to the mesosphere and lower thermosphere (MLT). The project examined how tropospheric winds and storms modulate the generation of GWs, how GWs propagate across the tropopause into the stratosphere, and how the Polar Night Jet and tidal winds influence GW propagation and breakdown in the middle atmosphere. Important observational components of DEEPWAVE included in situ measurement from the NSF/NCAR HIAPER Gulfstream-V research aircraft along with surface, airborne and satellite-based remote sensing. EOL also deployed an Integrated Sounding System (ISS) with a radar wind profiler and other ground instrumentation on the West Coast of New Zealand. Determine the relationship between GWs in the Upper Troposphere and Lower Stratosphere (UTLS) and GWs in the Mesosphere and Lower Thermosphere (MLT). Implementation of new airborne remote sensing lidars and a mesospheric temperature mapper (MTM) to extend GW measurements into the MLT. Assessment of GW variations with altitude, including filtering and interactions throughout the stratosphere and mesosphere, and the implications for vortex-edge drag and MLT forcing. Development and testing of numerical models of GW generation and deep propagation over several density scale heights. Fundamental predictability studies of GWs and their secondary effects, which will guide our improvements in GW prediction and parameterizations in applications for numerical weather prediction, climate, and general circulation modeling communities. 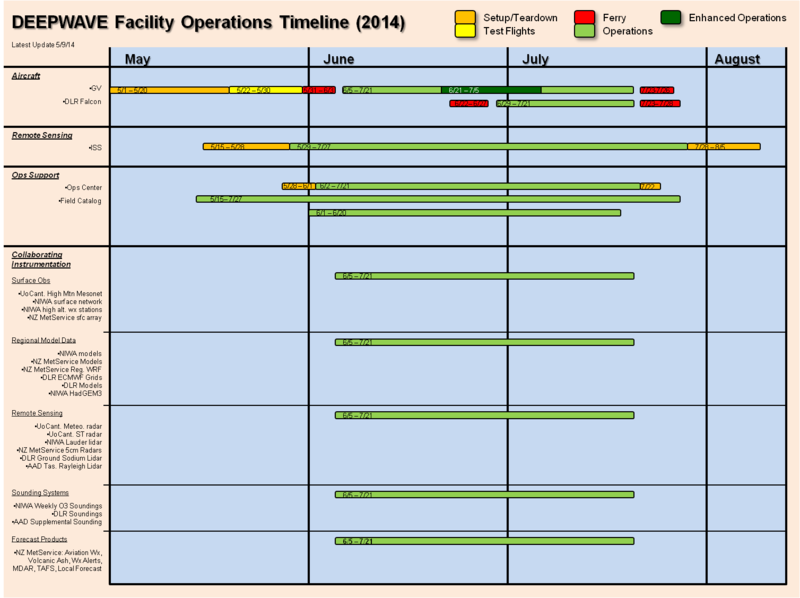 The DEEPWAVE Facilities Timeline below summarizes the deployment of various facilities and other special observing support for the DEEPWAVE Project. Some details are provided on the timeline for set-up, ferry and actual data collection period.